This beautiful, pewter ash catcher features a silver-toned finish, elaborately decorated with a display of mystical imagery. At its top is portrayed an interwoven pentagram, where you may place a piece of stick incense within the holder at its center. 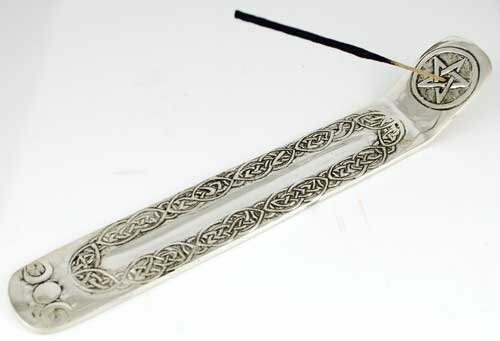 Extending out from this is a long tray to catch your incense ash, bordered in an intricate pattern of Celtic knots ending in the triple moon symbol for the Goddess. The entire piece measures approximately 8 3/4" long and 1" high. If you have any questions about this product by AzureGreen, contact us by completing and submitting the form below. If you are looking for a specif part number, please include it with your message.